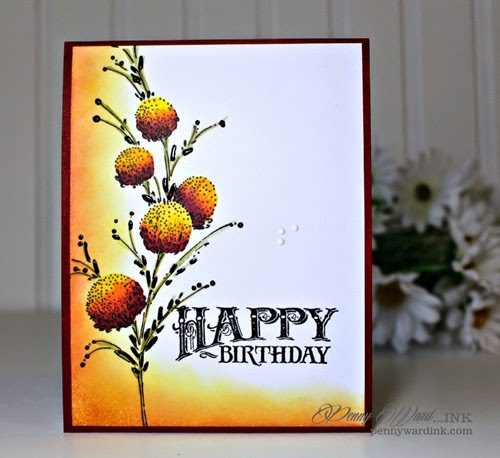 Chosen as a Favorite of the Week at Split Coast Stampers! Wowzers on the kind of paper you select to color on. I used Copic Express It paper and the color goes on real smooth but what I really noticed was the crispness of the stamped greeting. 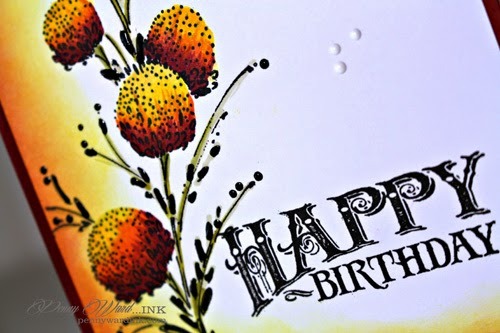 I stamped the image and greeting with Versafine Sepia, then colored and inked edges. Tiny buds were coated with Bamboo Leaves Pico (not really excited about how that part turned out, but I can live with it, Should have done just a few of these instead of all). Ok. So, this coloring kick you are on is generating some WOWZERS!! Love how gorgeously you color and the perfect accents you add - I think it all looks so marvelous!!! Wishing you a wonderful weekend!! What a beautifully colored card. The colors are great. The card pops off the page - great colors. Someone will love this birthday card. Penny, I just love how you have only shaded two sides of this glorious card. It just creates so much depth and interest without bulk. Love it! Thanks so much for joining us at CASology this week! Wow this is beautiful. Stamping, coloring, inking - everything's perfect! Gorgeous CAS card Penny! So pretty and I love the beautiful warm colours. STUNNING, love your inking, as always brilliant!!!!! Thanks for joining us this week at CASology so glad that you did- Please stop by tomorrow too, we have another great one for you - and I hope to see you join in too!!!!!! This is so beautiful. I love the colors and the card design.